As someone who grew up in the south, I am often annoyed by “southern literature” in the same way I am often annoyed by “southern” accents in movies. Books about unplanned pregnancies also often annoy me, as they so often manage to simultaneously vilify and idealize reluctant mothers to be. 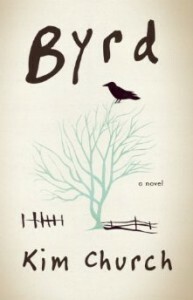 To say that Kim Church’s Byrd impressed me without annoying me speaks volumes about the book, which is indeed set in the south and is indeed about an unplanned pregnancy. The basic premise of the novel is this: girl suffers a one-sided high school crush on Bob Dylan wannabe classmate, and though they become friends, the crush remains one-sided. The girl grows up, she and the Bob Dylan wannabe go their separate ways until, as sometimes happens, they reconnect. She flies to California to commence a short term (and still rather one-sided) relationship with the struggling musician. Naturally, she ends up pregnant. Naturally, she doesn’t want to keep the baby. And naturally, the abortion malfunctions, and there she is, pregnant and, of course, still not interested in keeping the baby. What’s so likeable about this book is that while the aforementioned details sound potentially cliché and overwrought, the novel isn’t. In the character of Addie, there are no shades of Juno and no maudlin maternal yearnings. If Addie does wrestle with guilt, the book is not designed to highlight her guilt. Instead, we get a story about what happens when things don’t turn out quite as we expect them to and what the process of dealing with these consequences is like. In addition to Addie, we meet other characters who suffer their own disappointments. There’s Roland, the baby’s father, who sustains a head trauma in his childhood and can never quite make things right. There’s Addie’s father, who struggles with the alcoholism that not only disappoints him, but his family as well. And there’s Addie’s mother, who is left to deal with the wreckage of her family’s disappointments. There is also the titular character, Byrd, who we don’t spend much time with, except for a harried delivery and a few reports from the adoptive parents. Instead, we get to read the letters that Addie, on the advice of a social worker, has composed to Byrd. The letters are perhaps the strongest parts of the book, allowing Addie to confess in lyric and lovely prose the things we might not have otherwise learned from her. These letters make you empathize rather than sympathize with Addie, and this makes for a much closer and, oddly enough, less sentimental read. The scenery of the book, too, is strong. Church transitions easily from the heavy and humid North Carolina countryside to the dramatic sweeps of the California coast to the arid hills of Reno, Nevada. The landscapes fit well with each character’s quest for peace, and they helped maintain the tension in the plot. There were some aspects of the novel I wasn’t quite as pleased with. Church, a lawyer, at times gets burdened by explaining the legal issues surrounding adoption, and this cuts into the narrative of human drama. There are also some extraneous tangents that the author takes to introduce a scene, details that were perhaps included to bolster local color, but that, for this reader, detract a bit from the plot, like the vignette about the baby survivor of a neighborhood fire, and the details about Addie’s brother Sam, which aren’t fleshed out well enough to seem vital to the plot. Despite these issues, the story resonated for a good while after I left the book. Not only did my appreciation of Byrd grow, but in remembering it, I felt each loss anew. Anna Whiteside is a 2009 graduate of the MFA program at UNC-Greensboro. She is a native of Georgia, and holds a bachelor’s degree from the University of Georgia. She currently lives in Greensboro, where she is the scholarship and fellowship coordinator for North Carolina A&T State University.